I've only been familiar with Pupi Avati through two of his horror films. House with Laughing Windows is unsettling, with some very unexpected twists, while Zeder is an interesting mood piece involving zombies. What was most interesting about La Seconda Notte di Nozze comes in the first few minutes, with Avati compactly conveying the desperation of people in Bologna immediately following the end of World War II. Avati is more indirect in cutting between scenes in Bologna with that of rural southern Italy until it is revealed that the dumpy man who extinguishes bombs and mines in the countryside is the brother-in-law of the homeless woman in Bologna. The film is about deferred dreams fulfilled, and was the most affecting film of the three shown Sunday evening. The second film of the evening echoed earlier films. Once again Italian young people go on holiday to Greece, this time to Santarina, more photogenic, and with better music. 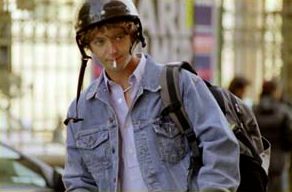 This is also the second film in the festival to star Silvio Muccino, who again co-wrote the screenplay. Muccino is only twenty-four but with four writing credits, and a top young star in Italy, he will probably follow his brother Gabriele to the director's chair. 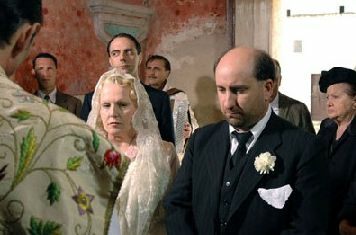 Muccino chases Violante Placido to the Greek resort. Ms. Placido is the daughter of director Michele Placido. She is also now making a film about Orson Welles life following his divorce from Rita Hayworth. La Seconda Notte di Nozze features a clip from Lady from Shanghai. The film itself is about three high school friends who go to Greece together for one last holiday after graduation, chase after girls, get high and gain a little more self-knowledge. Hopefully young co-star Katy Saunders, who plays a student infatuated with Muccino, will be heard from more decisively in the future. Maria Pia Calzone is fairly attractive. She is also one of the least convincing screen transexuals I have ever seen. What little Massimo Andrei knows about transexuals or transvestites seems to have been gathered from seeing The Birdcage. The only scene that rings true in Mater Natura depicts a politician shifting his public stance on issues after private assurances that he supports GLBT rights. Part of the film is a fantasy concerning an organic farming collective run by the friends of transexual prostitute Desiderio, and Desiderio's attempts to reconcile with her parents, and her love for a man who chooses to get married. Thankfully, this was the shortest film of the night. In the meantime, I was wishing that I could trade the money I spent on the festival pass for a screening of Fellini's last movie. Even the prospect of seeing a film by Umberto Lenzi would be more interesting than the mediocrity that seems to dominate this festival.